Monday- Sister Cauble felt impressed after dinner to go see one of our investigators we hadn’t seen in like a month. Low and behold: she was home!! AND all of her daughters were there too. We got to teach them and set up times to come back which was something we hadn’t done in a while. We realized how much the spirit guides us as missionaries. We literally could NOT do this work without it. That is the way Heavenly Father communicates with us and gives us direction of what to do, and considering He’s all knowing, there’s no one better I’d want giving me instruction. Seeing how important the spirit is as a missionary has helped me see how important it is to have just in general. When I get home it’s still going to be crucial for me to do and follow the path Heavenly Father has in store for me and my future family. We must always be worthy of that spirit and heaven sent inspiration. While I was writing in my journal that night we got a phone call, one of the best phone calls I’ve received in a while!! I found out that one of my investigators, from down in Diamond Bar, was getting baptized on Saturday and that I had permission to go attend it! I started to cry and cry. Tera was supposed to be baptized my last week there, but due to some difficulty we all decided it would be best to wait a while til things settled down. Well, homegirl stayed strong this whole past 5 months, and now it was time for her big day. I sat in awe. I was so grateful for good missionaries who had continued to love and teach her after I left, for the members who took such good care of her during a hard time and most importantly for her faith. She knew from us teaching her that this was true, that this was God plan for her and she was willing to do whatever to make sure she did this. Needless to say, I was too excited to sleep that night haha. Tuesday- I hid in some elders trunk and scared them. Look, it’s not weird, ok? 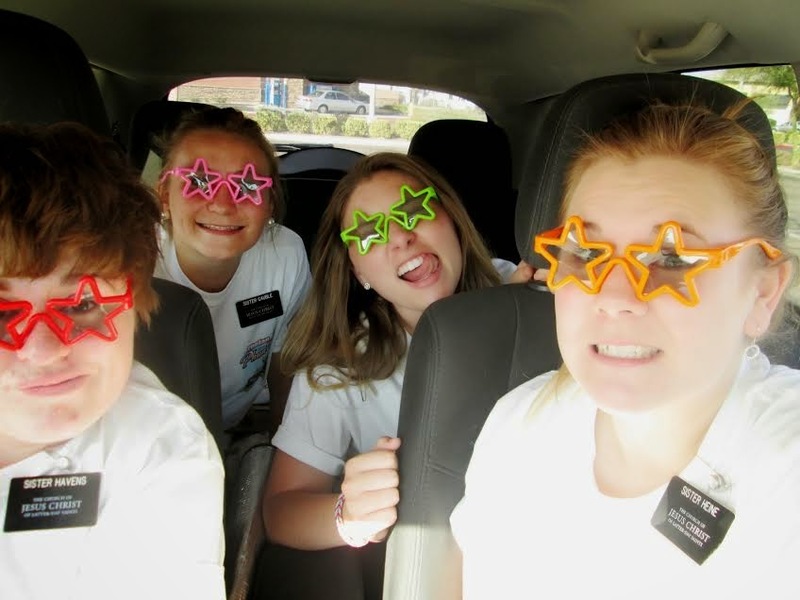 It’s normal…for me.. ;p Our leaders told us this week on Thursday us missionaries will get to preview the new movie: Meet the Mormons! Talk about SWEET! Don’t worry, I’ll let you all know how incredible it is!!!! This day was full of awkwardness. All. Day. Missionary work=most awkward situations of your life. The worst is when you are knocking someone’s door and then they pull up in the driveway. Boy oh boy. It’s cool though, the more awkward moments, the more blessings…that’s what I like to tell myself anyways haha. So since we moved to this new apartment we had NOT been getting mail whatsoever. Not even our weekly coupons or anything. We finally went and talked to the post office (which didn’t help at all) so Monday night we decided to take it to the Lord. We simply expressed to Him that we were worried about the situation and weren’t sure if someone was stealing our mail and to help ease our minds. After our meetings this day we went to the mailbox and it was JAM PACKED with the last months’ worth of mail hahha. I love that Heavenly Father even cares about the small, simple and silly things like that in our life. He cares about it if we care enough for Him to go to Him about it. He’s so good to us! Wednesday- a 10 year old FINALLY, after $60 worth in quarters and 5 weeks of looking, found me a FL quarter hahaha. My Zone Leaders kept making fun of me saying “yall” by saying it in between every word they said in our conversation haha. I miss the south. Mostly just the fried foods, but I guess I miss the people too ;p This day was super cool because we were told there was a man potentially interesting in the church so we called him, he invited us over for dinner and a lesson all in the span of like 3 mins. We were in shock. That never happens! He was so eager and excited. It was cool. Thursday- We had a little time to spare before going to a lesson so we thought to go see this one girl we’d met a month ago. We had asked her to come to our ward talent show and she didn’t end up coming so we were going to tell her we missed her. Only problem? We didn’t know her name and she has one of those dumb confession doors (or so I call them) where you can’t see IN the house. So we didn’t really know how it was going to work given the circumstances. Well, before we got out of the car at her place in my prayer I asked Heavenly Father to help us not have too much awkwardness and that if it were possible, that we would be able to SEE her and know who we were talking to so we could set up a time to come back. We ended the prayer, got out of the car and as shutting the door she pulled up in her car….UHM. INCREDIBLE. It’s crazy what happens when we are crazy enough to just ASK God for help. Awesome. COOL COOL COOL: to make a long story short, all of the deaf people are now having to go to the wards in which they live in, they can’t just go to the last ward I served in anymore. I found out Monday we were getting to teach David now (because he lives in our area) a deaf Recent Convert (a person who has recently been baptized) of about 6 months. I WAS SO HAPPY. Well we had a lesson with him this day and it was so amazing. It was the 1st time I was in a situation where I didn’t have S. Treadwell who’s super fluent in sign to help me out. Luckily, Sister Cauble has taken sign in high school a little so we leaned on one another. After much help from the spirit and Heavenly Father we were able to share a message with him, communicate with him and resolve some concerns he had with all the changes going on and help him feel of the Saviors love for him. I know that Heavenly Father knows SO much more than we even can comprehend. Coincidence that I got sent to the neighboring ward in Hesperia after having learned sign for 3 months in Bear valley with a comp that has some type of ASL background? I think not. I think Gods plan is perfect. Also, the elders called us and sang (in a quartet) for us a hymn. Random. Beautiful. Hilarious. The little autistic boy I told yall about goes “hey. Sister toolan. Hey. I think you’re pretty hot!! !” hahahahhaha I died laughing. Christ never spent all His time with people that were living right and doing what they needed to, He was going around helping people out that needed to know they were living wrong and who needed the miracle of feeling his forgiveness is their life. Church is NOT for perfect people. Its where we go and learn how to someday be perfect like the Savior. It’s where we go to strengthen one another and help each other on this crazy path we call life. It’s for all us imperfect people. I hope you never feel like you aren’t good enough to go to church. We must go there to be able to feel Heavenly Fathers approval for doing something he has commanded us to do. Church is so important and without it we cannot and will not be spiritually fed/full. Saturday- MOST BEAUTIFUL WEATHER IN A LONG LONG TIME. This was a great day because I got to go witness Tera get baptized. The last time I saw her she wasn’t showing (prego wise) and I walked in to a woman who is due in 2 weeks!!!! When she saw me and another sister that I came down with who taught her after I left she goes “THERES MY GIRLS! !” talk about great feeling to hear that!<3 when she went under the water I understood that God was allowing me to see a little more of His plan…there Tera was, pregnant as ever, getting baptized..her decision effecting everyone in the room, the one still inside her and all her future family to come. The spirit was so strong. I was so happy and proud of her. She is and always has been an example to me. Sunday- I am running out of time….darn it….ok, point blank it was an awesome day with awesome stories that will have to come at a later time hahha. Church was good. It was cold out :) we got a new investigator. All in all we found 3 new investigators this week..something that hasn’t happened the whole transfer. Or in a really long time, for that matter. We trusted in the Lord, smiled more than ever, laughed hard as always, gained stronger testimonies and worked hard. I’d say it was a fantastic week. I’d love to tell you more, but I know I’ve already information overloaded yall. Hahaha. So until next time….as a good friend of mine would say—keep on keepin’ on! Ps: YOU BETTER WATCH CONFERENCE!! Many animals in the mix this week! Oh boy. Tomorrow I hit 11 months on the mission. Is this real life? I still remember saying bye to my family at the airport, being nervous out of my mind going in to the MTC, crying in Diamond Bar wondering if I made the right decision to leave my life behind to go on a mission…and now here I am. 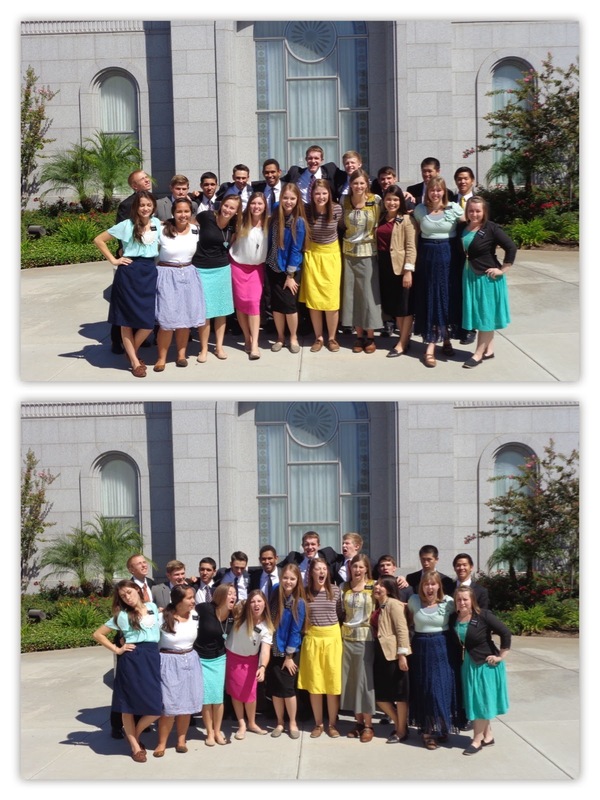 Loving every crazy second of my life as a missionary. In tears thinking about how fast it’s gone and will continue to go. Don’t get me wrong, I love yall and I’m excited to do certain things again, but I love these people. They are just as much my family as you are. These people are the ones I wet my pillow at night worrying about, the ones that have given me an opportunity to grow faster than I ever could have back home, the ones that have shared testimonies with me that will stay in my heart for the eternities. No matter where I end up at points in my life, a part of my heart will always be here in California. GUESS WHAT TIME IT IIIIIIIIIIIISSSSSSSSS?!?!? General Conference time, baby!!! I am so excited. This weekend is the women’s part of it and I know it’ll be good. Make sure you invite your friends/family to join in with you. Saturday night! Share with me what you learned from it next week in an email or something :) Make sure to prepare yourSELF for it so you can get as much as possible out of it. We are so blessed to hear from inspired speakers this week. This week I was sick in bed for 2 days, so that’s always a bummer. It stinks because I was the contagious sick, therefore, I was homebound. Luckily, the Lord helped us be SUPER busy and jam packed on the days that I wasn’t in bed. - Didn’t die from a black widow bite while helping someone clean out a shed….that hadn’t been touched in 30 years…. - While we were waiting for our elders to meet us at the park for a meeting Sister Cauble and I got to lay down on the grass and look at the pretty night sky. It sounds silly, but it was so refreshing and nice. Haven’t done that in quite some time! - Went and visited like 3 potenial investigators and every single one of them told us we could come back (even gave us a specific day) and teach them. It was the moment we’ve been waiting for this whole transfer!! It was proof to us that Heavenly Father truly is preparing His children to hear the gospel. He’s also preparing us, the ones trying to share that with them. - Being sick in bed brought a hidden miracle: it allowed Sister Cauble and I time to really open up to each other, share stories and get closer than we already were. I really enjoyed that time spent with her…minus the being sick part. Yuck. Oh, also a blessing that she didn’t get sick as well. The elders that we share the ward with did..she was the chosen one!!! It’s okay though, we prayed really hard for that haha. - When I was on exchanges with Sister Higbee we got to do service for a family that wasn’t members. Well, even though no one WE are teaching showed up at church yesterday, the whole family we helped out was there with their member daughter! It was the coolest thing ever. They were so happy and enjoyed it. You could tell that because we made that connection/relationship with them by just helping them and making them realize missionaries aren’t just around to baptize people, but to love them and serve them as the Savior would if He were here with us, that we were able to plant a seed in their hearts. I know they will accept the gospel someday. 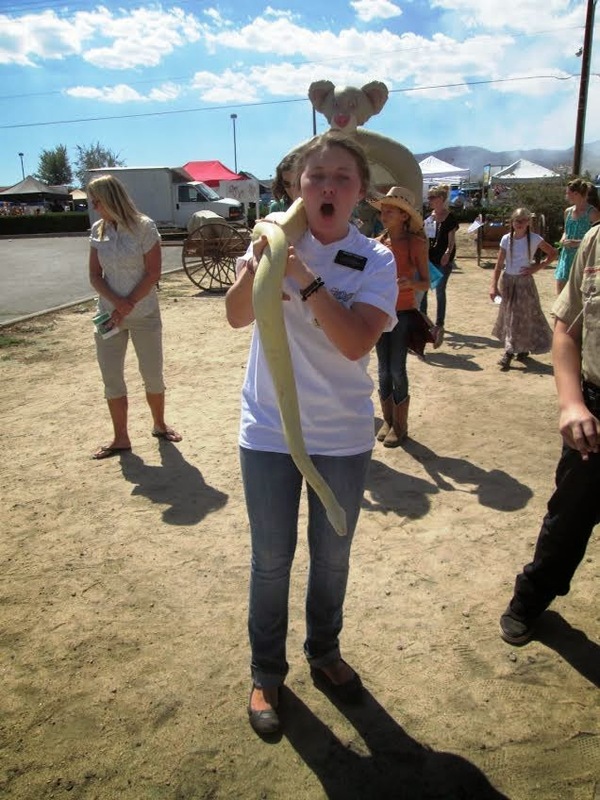 Speaking of which, that’s one of the neatest things for me as a missionary. I know, truly know in my heart those that will accept the gospel someday when I see them. Reason? Because we pray for eyes to see those we come into contact with as the Savior would. The Savior helps us see them for what they can become, not what they are. He helps us see the potential in all. I knows it’s Him because I darn sure couldn’t be doin’ it on my own! - BEST PART OF THE WEEK: we (all 4 Mojave River missionaries…btw: you should know that I always pronounce it as moe-jov-aay rivaa. Gotta spice life up. Always.) helped set up for a wedding reception. That can be very very very cruel at times because then we get to thinkin’ about marriage!!! Lol But, no worries, it was a blast. It was perfect because it was actually “Hesperia Days” as well so right at 7:30 after the party got done we took chairs out to their front yard and watched beautiful fireworks. That was nice considering on 4th of July we had to be in by 6 and didn’t get to see any :p the best part came after that, however. A DANCE PARTY BEGAN AS WE WERE HELPING CLEAN UP. It allllllllll started with the throwback “My girl” which then made me think of silly Hannah Singletary and I singing that in the halls of school, at dance camp to the cafeteria ladies, just pretty much everywhere :p we ended up dancing for like 9 songs straight. Best night in a loooooooooong time haha. That’s where I am happy. On a dance floor actin’ like a complete noob!!!! All in all, pretty darn good week. I can’t wait to give it all I got this week!! Keep having a sense of humor and enjoying life. Step out of your comfort zone and be a friend to someone. Pray for missionary opportunites!!!! Love you….baby….<-----Emily Grace Jones, I did that for you. You’re welcome. Sister Toolan needs FL quarters....NOW! ATTENTION ALL WHO ARE ABOUT TO READ THIS: I need you to do something for me…please :) Will yall all go look through your quarters and if you find a Florida one, grab a little envelope and send it to me please???!! There is a guy here in this ward that will make a quarter ring out of your state quarter, so now you see the importance in this really random favor! I will love you forever. I understand right now how important working with the members is. I see now that until the ward where we are serving are prepared to fellowship, bear testimony to and love the people we find then Heavenly Father isn't going to give us those prepared ones. It's my job as a missionary to help the members in the areas which I serve to understand what their role is as a member missionary. I know that it’s a lot easier for some to be missionaries when they have a tag on like me, but regardless of the tag it’s our job to be sharing this great message with others. Doctrine and Covenants 24:12 And at all times, and in all places, he shall open his mouth and declare my gospel as with the voice of a trump, both day and night. And I will give unto him strength such as is not known among men. I love this scripture because to me sharing the gospel with others is sharing your testimony with people. It’s standing in line at the store and when asked how your weekend was instead of saying “good” it’s sharing something you loved/learned at church. It’s living a Christlike life, it’s being kind to others and not being scared to share what you KNOW to be true. Because you do. You know it is! I especially love the last part of the verse where the Lord is promising to give us strength such as not known among men. When we are doing what the Lord is asking us to do (and He is BEGGING us to share the gospel in these latter days if ya didn’t know) He is GOING to have our back. He won’t leave us hangin’ out to dry. He will tell us what to say, when to say it, who to say it to. He will watch over us. So this week I want you to share your testimony. Pray and ask Heavenly Father who you need to share it with and don’t question it, go out and do it. I promise you’ll see blessings from it. I wish you knew JUST how many people try to marry us sisters off to people they know. It’s been pretty bad since I’ve gotten to Hesperia haha. There will be women and men who will try and sell us their sons, brothers, nephews, friends, you name it they’ve tried it! It’s always super awkward and hilarious. I guess I’ll take it as a compliment?? Ha. Someone opened their door to us in a bra this week. Yes. Strange things happen on the mission. I will leave you on that note :p love you all. Go make me proud!!!!!!!!!!!!!!!!!! They cook biscuits in Cali! Exchanges with S.Higbee! We helped set up for a circus party! Complete honesty? This week was really slow. Actually, let me correct that statement—it’s been a long TWO weeks. We really haven’t been able to get in to see anyone the missionaries had already been working with, not that many people have allowed us to talk to them, not even that many members have been home. It’s crazy though, because even though it’s been slow during the day…it’s gone by way fast. We have been working our tails off. We have been knockin’ all the doors you could think of. I think its Heavenly Fathers way of teaching us how to get back in the habit of talking to people, the importance of still finding on our own even when we have people to work with. It has helped us see many miracles. -our nonmember neighbors offered to give us a free washer and dryer for our place!!! -got to do the coolest service project of my life. We helped a man in the ward that breeds birds catch some to sell. We were runnin’ around like chickens with our heads cut off…hehe. I wish we could have videoed it, because it was priceless. -one of the elderly missionaries in the mission office called me his favorite missionary!! :) hahah. My favorite miracle this week though: we knocked this one door and a Hispanic woman opened up. Her two little kids, who were EXTREMELY shy, were standing with her and wouldn’t look at us. We asked if she would want Spanish missionaries to come visit her and she politely said no. we smile, gave her a card, said goodbye and before you know it the two little kids ran out to give us the biggest hug ever. Why this was a miracle? I walked away KNOWING that because of their sweet, innocent spirits, those two little kids KNEW Sister Cauble and I were representatives of Jesus Christ, that we were good and that what we had to share was true. Heavenly Father helped strengthen my testimony that people can know just from our countenance, depending on whether or not we are worthy of the spirit, who we are and what we stand for. Even two little kids under 8. Around a month ago the district leaders came out saying we weren't supposed to be letter writing any other day than Monday and my thought process was "I will start following that rule once I get caught back up on the million letters I have to respond too..." then this week (after still not even having time to have finished them anyways lol) I was humbled and realized that if I follow through with that mindset that I am 1. showing the Lord was is more important to me, which is actually of no importance. 2. I’m ridding myself of blessings from following the rule and 3. Justifying, just as our investigators do at times the commandments. I made the decision to stop and never do it again. I am happy with my decision. It’s funny how we always are happy with our decisions, no matter the outcome, when we do something Heavenly Father smiles down upon. Most perfect recipe for biscuits that you'll ever find? Melt some butter in a pan before you dish out the mix to put in the oven….oh my word yall. You probably think I’m crazy, but I’m 100% serious. Best. Things. Ever. I guess sour cream makes anything/everything moist. So for those of you reading this that are cookers (mom, don’t even TRY to act like you are ;p jk, love you!!!!) this is going to benefit you in the future lol. The more you know, the more you know you don’t know. Think about that for a second. It’s like church: once you start going, the more you learn. Then, the more you learn, the more you understand just how much we don’t know. A little girl asked this week why God doesn’t just let us know everything there is to know. But if that was the case, there would be no point in even coming to earth. We come here to be tested. To see if we will have the faith to follow Him or if we will take the “easy road” out. Knowing everything would defeat the purpose. However, the more we diligently study, pray, ask Him questions; the more He will reveal unto us at this time. Heavenly Fathers plan is so vast and perfect. Our mortal, imperfect selves just could NOT handle alllllla that!!!! We got to go to temple today as a zone and I feel so happy and refreshed right now. It’s so nice going and learning more about the Savior and His plan for us. The spirit is so strong just when you walk in the front doors. I know that when I go home being worthy to go and striving to make going a priority no matter how close/far it’s located is a goal of mine. I’m so thankful to have a mission president who allows us to go and refocus, recommit, and relearn at the temple. I hope you’re all doing your part to help the missionaries find people to teach. Know that I love you all so very much and am thankful for the support I receive from you. Be happy. Be thankful always. People. You are all amazing and wonderful, but sadly I just don’t have a ton of time to email home this week…and just so it’s no surprise to any of you—next week will be the same way. Why? WE GET TO GO TO THE TEMPLE NEXT WEDNESDAY. That is like every missionaries dream come true. The temple helps put your life into perspective and gives you the strength you need to just carry on. Which we need. Missionary work is the most tiring work I’ve ever done. It’s not just physically draining; it’s emotional, spiritual, the whole shebang!!! I wouldn’t trade it for the world though. This is going to be funny to some of you who know what I’m talking about. Remember in elementray school (if you went to Walker) when we learned the “We are the owls, the Walker Owls” song? So this week I’m in the middle of telling Sis. Cauble what I learned in my personal study and that darn song came into my head and i ended up singing the whole thing for her!! Why is it that I can remember a song I learned years and years and years ago, but I can’t remember anything else that is actually relevant in my life hahhaha. Sister Cauble and I moved apartments this week (because I have Jeri Toolan runnin’ in my vains and I GET STUFF DONE!!!) so we didn’t have too many opportunities to actually get out and work. Moving takes a lot more time than I ever realized haha. Goodness. I really don’t have time to tell you much more. Okay, love yall.